To make it easier on you this is a one page article, heavy on the screenshots. It is specifically created for the average user and thus relies on the GUI configuration options when possible. It is my hope you find this article useful. For new Linux users. Windows networking on Linux is handled via Samba. Recently the Samba Web Administration Tool (SWAT) has had a few security issues as it is no longer being maintained. This has prompted a proposal to remove SWAT from Samba entirely. See: Samba developers considering removing SWAT . As of this writing I have seen no official statement on the matter. However openSUSE forum moderator jdmcdaniel3 discovered that the openSUSE developers pulled SWAT from openSUSE 12.3. Previous versions of this guide used SWAT in the tutorial. Obviously this is no longer the case. AFAIK there is no GUI replacement for SWAT. Identity tab: Enter your Workgroup name (the actual workgroup name from your Windows machine) and the name of your computer. Highlight nmb and click the Enable button. Repeat for smb. Click the OK button. Open Dolphin. Pick a folder you wish to share, right-click on it and choose Properties. In the resulting window click the Share tab. 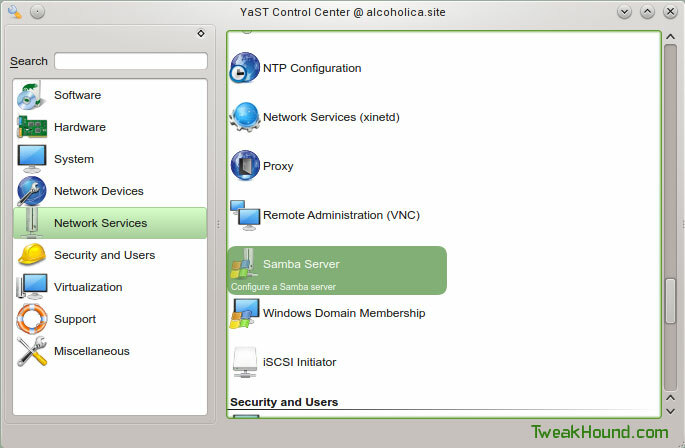 Check the box Share with Samba (Microsoft Windows). The Allow Guests box is optional but can make things easier (may be a security risk). This user needs to already exist. You can use your account if desired (if not then it’s best to add them through YaST). type the following smbpasswd -a username and hit enter (where username is the name of the user you wish to add). Step 5 – Letting the network do its thing. Now we are going to shut down every machine on the network. If you have a home server, a machine with a shared printer, or a machine that is usually on more than most then boot that one up first. Let it get fully booted up then one-by-one start the other machines on the network, letting them fully boot up before booting the next one. This method allows the network to sort of ‘reset” itself. Once complete you should be able to browse to all network shares through Konqueror or Dolphin. Look for the Network icons. You’ll be going to Network > Samba shares (or SMB shares) > your workgroup.